My husband bought it for me during our first vacation away from the kids. Hawaii. Kauai. Coconut Marketplace. 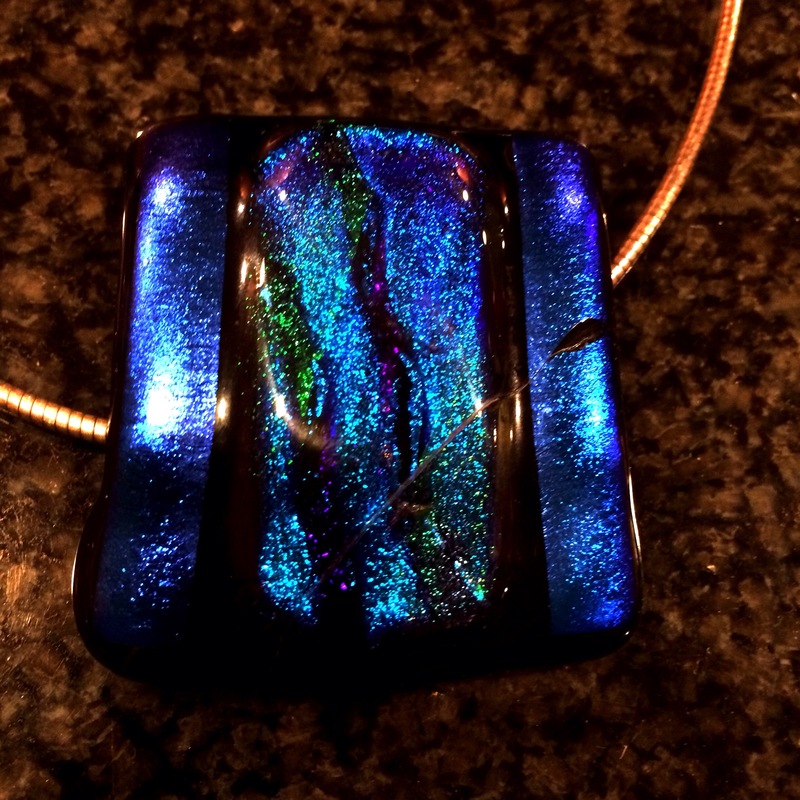 The brilliant blue pendant caught my attention when we walked by the small fused glass shop. It reminded me of the glistening ocean. I couldn’t take my eyes off it. I didn’t own any expensive jewelry, and I cringed when she told us the price, but Phil insisted on buying it for me. I stopped feeling guilty about the price when I realized how many excuses I could find to wear it. It quickly became my most prized possession—representing everything beautiful about our vacation and our relationship. It’s easy to forget about beauty when you get caught up in endless loads of laundry, and dishes, and homework, but every time I fastened the clasp of my beautiful necklace, it helped me remember all of the precious gifts I had been given and I resolved to take better care of them. But a few years later, during an especially stressful time—a move, returning to school to finish my degree, and the birth of our fourth child all in the same year–I struggled to see any beauty amidst the chaos in my life. And it was hard to see the makers of the messes and dishes and laundry as precious gifts. With the pressure of my responsibilities constantly weighing me down, I never felt like I measured up. I even began to doubt that Phil could see the beauty in me when I always felt like a giant mess. It all came to a head one Sunday morning when the kids sat waiting in the car, and Phil tried to hurry me out the door. I rushed to finish putting myself together because I had insisted on ironing the shirt I wanted to wear when there really wasn’t enough time. And then I realized at the last second that I had only put mascara on one eye. While I fixed the problem, I thought about how short I had been with everyone that morning and I had to fight back tears. It would be so much easier, I thought, if I just stopped trying to pretend. It would be so much nicer to just stay in bed on Sunday morning and give up trying to be perfect. Just as I brushed on a final stroke of mascara, the horn blared in the driveway. I jumped and blinked hard. My wet lashes left a black smudge on my cheek and eyelid. I looked like a character from a horror movie and I felt every bit as evil. We were already going to be late. SO WHAT?! They could all wait until I was good and ready to come out. I put on my tall heels and stomped over to my jewelry box, pulling out the blue necklace. Standing on the tile floor, I worked to fasten the short chain myself. Phil usually clasped it for me, but I wasn’t about to ask for his help. After a couple of unsuccessful attempts, I twisted the clasp around toward the front to try again, but somehow in the process, one end of the chain slipped out of my fingers and the heavy glass pendant slid off. My heart stopped and the world turned to slow motion as I watched my treasure drop to the floor. It restarted again when I realized that the pendant was going to land on the bath mat, not the tile, but my relief was temporary. It landed hard, bouncing once on the mat, again on the tile next to the mat, and then a third time, when the glass finally cracked diagonally from one corner to the other and came to rest in two pieces. I couldn’t stop crying during church. It was testimony meeting, so it might have seemed kind of normal if I hadn’t started during the opening song. It was more than the loss of something material that I prized–the broken necklace represented all of the ways that I was failing in my life. Failing to take care of the people who were the most important to me. Failing to become what Heavenly Father wanted me to be. Constantly falling short. I was broken too. But something beautiful happened when we came home. Phil examined the broken necklace, but he wasn’t mad. He didn’t criticize me for trying to fasten it myself while standing on the tile floor. He didn’t remind me of how much it cost. Instead, he put his arms around me and let me cry some more. “We can fix this,” he promised. Phil looked up the glass lady’s number and called her, seeking advice. A few days later, the special epoxy that Phil ordered came in the mail. He took his time, matching up the pieces and holding them in place as the glue dried. When he was done, I was surprised by how good it looked.Up close the tiny crack is visible, but most people don’t see the flaw. They only see the radiance and beauty of the blue. My repaired necklace is more precious to me now than it was before the fall. Precious because it taught me something important. We are all like the necklace. Inherently beautiful, we do things to ourselves, or things happen to us that leave us on the floor, broken—expecting to be thrown away because we’re no longer of worth. But there is someone who will always see our eternal value. Someone who paid the price for us. Someone who knows how to match up our broken pieces and glue us back together whenever we fall. Tear!! What a valuable and beautiful story. Adrienne, you are the epitome of grace, charm. Elegance, and radiance. You have always been a great example of the Lord’s gracious servants. I remember the necklace and remember talking to you about it. I remembered the story of Hawaii. Our loving Heavenly Father and Jesus Christ know how valuable you are. You are a great inspiration to everyone and especially me. I cherish our friendship and although we have moved far apart from each other I know I will always have a loving friend by my side through thick and thin. Beautifully written Adrienne. I’m so lucky you are my friend and I get to learn and grow by being around you. Love you so much! Mind if I share this with the young women? I am honored to be your friend. Share away! Thanks for sharing that. I really needed those words in my life right now.